Boost the nutritional power of your child s food. We all have days when we struggle to get even a little food inside our babies and toddlers. Why not increase the nutrition of their food? So even if they eat only little of it, it would at least be nutrition packed. Just add Little Moppet Food s Dry Fruits Powder to your child s food and relax. The Dry Fruits Powder not only increases the nutritional value of the baby s food, it also has weight gaining benefits. Almonds help with brain development, cashew nuts are great for development of muscles and bones, pistachios are high in fibre, turmeric is a natural antiseptic and nutmeg helps the baby sleep better. I bet you want to try it just for the nutmeg ?? You can add the Dry Fruits Powder to your child s milk (not formula), porridge, roti, pancakes, etc. to enhance the health benefit of these foods. 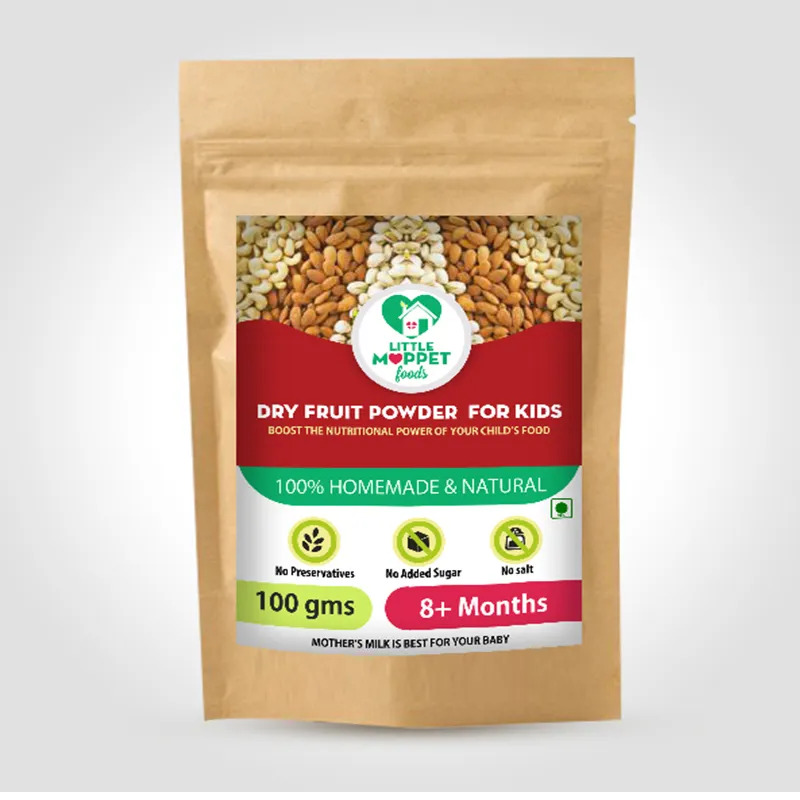 For Babies : Dry Fruits Powder can be given to babies above8 months. Please follow the3 day rule, add a 1/4 teaspoon of the dry fruits powder to porridge then next day too same amount and then increase it to half teaspoon of powder. The Dry Fruits Powder can be added toPorridges,pancakes, Rotis, desserts.For older Children : It can be given to older kids with milk. It serves as a good energy drink. 2 or 3 teaspoon of the powder can be mixed in hot or chilled milk for kids.